Omar Lopez-Chahoud interviews artist David Brooks for the March 2013 edition of the Artist of the Month Club. Omar Lopez-Chahoud (OLC): How is the edition for INVISIBLE-EXPORTS connected to the larger project at Storm king Art Center that is currently on view? David Brooks (DB): I used the opportunity at Invisible Exports to create a print edition that functions not only as works in their own right, but that also act as a kind of circulating back-story to the larger sculptural installation at Storm King Art Center. The project at Storm King is titled A Proverbial Machine in the Garden. The notion of a machine in the garden is a cultural symbol that underlies the tension between the pastoral ideal and the rapid and sweeping transformations wrought by industrialized technology. Within the American mythology, “nature” is often symbolized by a garden, while a machine invading the garden often symbolizes “technology”. Cultural historian Leo Marx underlines this idea in his seminal text, The Machine in the Garden: Technology and the Pastoral Ideal in America (1964). Historically, this metaphor is often expressed through the abrupt and confrontational intrusion of technology into a tranquil pastoral scene. This metaphor points back to the peak of the industrial era in 19th century America and Europe, but is also a metaphor that we are still living out today. The actual sculptural installation at Storm King comprises a 1970s-model Dynahoe tractor, complete with backhoe and front-end loader, that has been buried in a hillside in Storm King’s iconic landscape. Specific areas of the machine—like the excavating and loading buckets, and part of its cab—were chosen to be framed out in concrete shaftways left open to the sky, while the remaining body of the tractor is buried beneath the earthen hillside. Visitors are invited to stand on the shaftways’ steel gratings and peer down into the exposed compartments of the tractor below the earth. Speaking to Storm King’s past—as an agricultural site—and present—as a carefully sculpted pastoral environment—A Proverbial Machine in the Garden looks at how humans use, consume, and perceive of this particular aspect of the natural world. The buried tractor is symbolic of both farming and land-moving machinery that helped to build Storm King’s pastoral “natural” environment, while equally pointing towards the future of an increasingly globalized capitalist network consuming the landscapes of every continent. The cyanotype print done for Invisible Exports can be seen as a schematic illustration of this cultural construction, but realized and articulated in a collective manner. OLC: Why a print edition? DB: A print edition like this allows for the concepts and concerns of a fairly intricate project to take on a different kind of fluidity. It’s almost like bringing aphoristic excerpts into high relief, allowing them to act independently from a denser text. It was important that this particular print edition was an edition of cyanotypes – all of which are inherently unique, differing slightly in tone and exposure from each other since they were exposed directly by the sun. In this way the cyanotypes enact and engage some of the very elements (e.g. the sun and the elements) that the conceptual context insinuates. Following the same conceit, it was important that the edition was approached collectively. Since the historical trope being described (the machine in the garden) is a cultural trope constructed collectively over the last two centuries, it was imperative to have an audience enact and engage the process of identifying with the concerns surrounding the work, rather than myself didactically speaking at the audience. OLC: How is the audience collaborating with the print edition? DB: It’s quite simple. I have assembled an ongoing list of words, a lexicon so to speak, that pertains to the A Proverbial Machine in the Garden project as a whole. These are words that I have taken from Leo Marx’s text, as well as the Farmers’ Almanac and other sources, that are words commonly associated with themes of the “pastoral” and the industrial era. 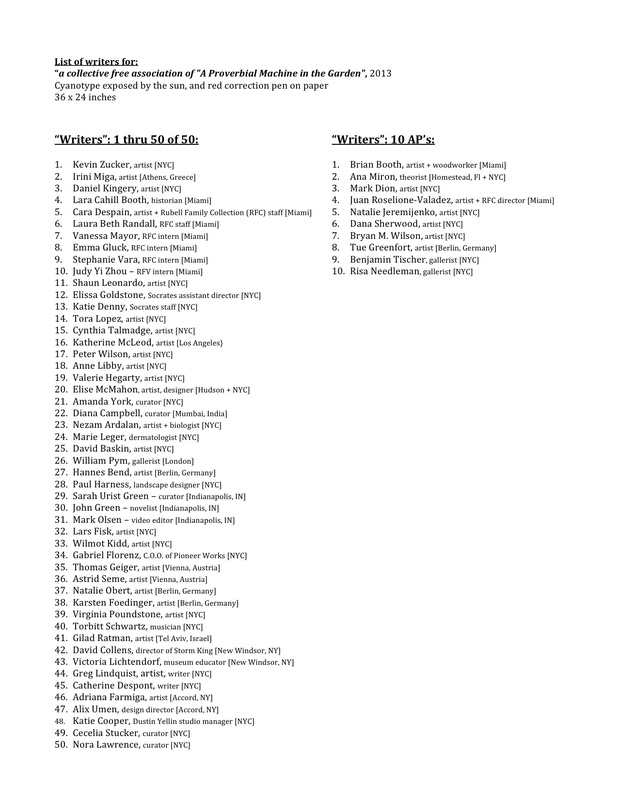 Sixty different people, or “writers” as they are called, will choose 6 words from this list, or they may add words of their choosing to this ever-growing lexicon. 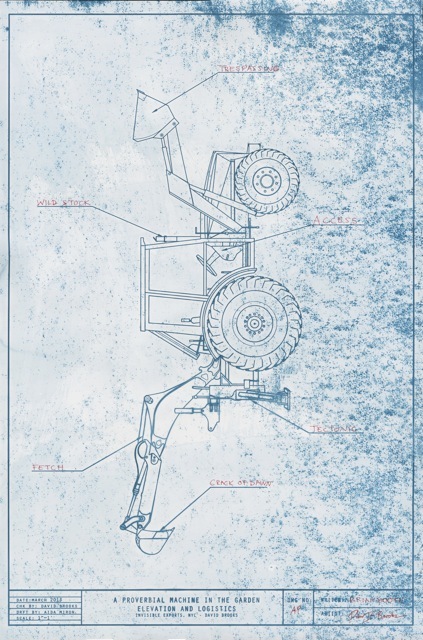 On the cyanotype print you will see there are 6 lines that draw indication arrows to specific components of the tractor on the blueprint. The writers will write, in red correction marker and in their own handwriting, their 6 chosen words on the blank lines of the indication arrows on the print, indicating the tractor component they feel is most appropriate for each chosen word. My hand will be absent. Ultimately, each print will have a unique set of words written in on it, and a different handwriting will execute each print. This process grants a uniqueness to each blueprint, and the social construction of the “Machine in the Garden” is thus enacted collectively. OLC: Do you see it evolving into something else? DB: I think this process of generating a collective-social imaginary is an interesting way to flesh out the back-story to seemingly convoluted projects. So, yes, I think it will evolve. Especially, if/when this entire edition could ever be seen together in the future. The idiosyncrasies in peoples’ word choices will begin to stand out in high relief, allowing them to simultaneously act independently as well as collectively as both a series and as a cohesive idea. They become subjective aphorisms while also adding up to something larger than themselves.